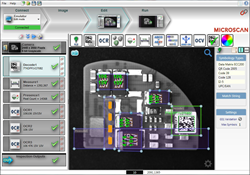 Microscan releases a new revision of AutoVISION 3.0.3 machine vision sofware, enhancing and raising the bar of its usability and ensuring the strength of the system. Microscan's newly released AutoVISION 3.0.3 machine vision software meets the need of end users to deploy easy-to-use technologies. Microscan, a global technology leader in barcode reading, machine vision, verification, and lighting solutions, announces the new release of AutoVISION® 3.0.3 machine vision software with advancements addressing the need of end users to deploy easy-to-use technologies. AutoVISION® software was first introduced in 2011, and has since been widely adopted by manufacturers and service providers looking to implement machine vision-based systems with minimal time, effort and training. AutoVISION® is known for its ease of use and intuitive interface, enabling users to successfully operate a system that meets their traceability, inspection and quality control needs. A new FTP Image Save tool enables the user to keep a better track record of the work history, meet quality management requirements and improve the automation processes by saving passed, failed, or all images to an FTP server for later review. Manufacturers using different networks in a factory, and geographically distributed companies with remote locations and technical support will now also be equipped with the Cross Subnet Communications technology available in Version 3.0.3 to connect to cameras across different networks and locations for programming and monitoring the system. A new serial command for downloading a job to a device via TCP/IP socket, adds additional value into the 3.0.3 version by providing the user with the ability to control the system with an external computer without the need to install AutoVISION on the controlling device. AutoVISION® 3.0.3 supports Vision Mini, Vision Mini Xi, Vision HAWK and GigE smart camera families and runs on Microsoft Windows 7 (32 and 64 bit versions) and Windows XP Professional. An updated version includes an X-Mode 3.5 decoding capability that adds even more power and capability for 1D and 2D symbol reading. The newly released AutoVISION® 3.0.3 has the ability to automatically recover in the case of power loss at the facilities or accidental disconnect from the network. The Device Disconnect Recovery technology used by AutoVISION® 3.0.3 does not require users to reboot the camera and software. AutoVISION® 3.0.3 is available for download on the Microscan website in the Support section for existing users who want to upgrade from AutoVISION® 3.0.2. All new Vision MINI, Vision MINI XI, Vision HAWK and GigE Vision cameras will be shipped with AutoVISION® 3.0.3 installed. For more information about AutoVISION® and machine vision tools, please visit here.